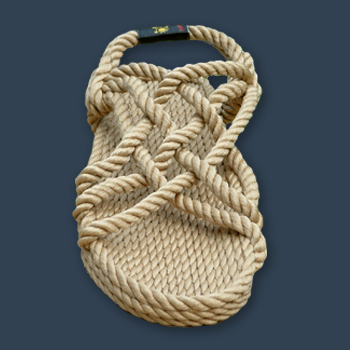 These sandals are made with natural rope, super comfy, light weight, durable, colorfast, fashionable and machine washable. The stylish sandals may be washed and dried along with your regular wash. They are bleach, chlorine, and salt water resistant. If they get really soiled, you may find it beneficial to soak them in water with a little tea tree oil then stick them in the direct sun outside to dry. You can also put them in the dryer. Wet sandals should always be dried thoroughly before storage. These sandals are adjustable. To adjust them, fiddle with the ankle strap - you will be enlightened. Retail price: $38.50. Limited time special offer: $35.95 with FREE shipping. All net proceeds support the Texas Organic Research Center. email doug@dirtdoctor.com or call 866-444-3478.